The last month of the year is coming to its end and this is the right time when we want to take some time to reflect on year 2014. The past 12 months have been an awesome from various perspectives so, grab your cup of tea, sit comfortably and enjoy! Yes, we know it – we announced Defend Your Life! around February and stated that release date was set for April 2014 but sometimes dark forces do everything to stop you in achieving your goals. Or, if you work in IT, you probably know how development can go and you can treat it like normal. And of course, responsible studio will rather deal with release delay than flame caused by unpolished game. Anyway, the game is online in Windows Phone Store from the October and we are sitting here with few tens of thousands downloads so far right now. And what is more important and more exciting for us – the feedback is just awesome. Of course, there are few problems but we check each comment alerting some bug (sometimes we just miss something) we hunt it and try to fix everything as soon as possible. The iOS and Android version will be ready in the January 2015 so we hope we will rock the year from the very beginning. Perhaps it will hit the stores little bit later while we are in negotiations with potential publishers. No names needed right now but some of them are really huge and pretty famous in mobile gaming world. Alda Games has 10 members so it is quite natural that Defend Your Life! is not the only title we are working on. Eggies were released to be hatched during the summer and feedback from admirers of virtual pet simulators is really fine so far. Right now we are preparing a Chinese release of the game and we are trying to find some steps towards the Middle East and North Africa countries. And next title is coming to its announcement but right now is not the time when is going to happen. Only what we share with you is that it is going to be a sequel of one of our previous games. You can guess but definitely stay tuned! This year was particularly special thanks various people we met. We decided to invade the world and attend few events in order to make some connections and friendships. First of all, we visited Budapest where MAAC event took the place as one of the gateway to the AppCampus. And we did it! Our project (just guess which one) was selected and got the financial support. What is important even more than money: other activities from AppCampus and Microsoft related to selection. 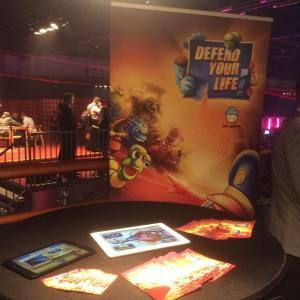 Just for example we were invited to present the game at Slush in Helsinki and this was great opportunity to attract massive audience enjoying the conference. We met many inspirational people (Finland is origin of Supercell and Rovio for instance) not just and only from our industry but various fields as well. Talking about the industry – we traveled to Paris in order to meet some big and small fishes on pure business to business event called Game Connection. And title of the conference didn´t lie. It was really about making connections and really about games. Great experience and few upcoming contracts seem to be evidence that that kind of events works great. As a Czech studio it was almost obligatory to attend Game Developers Session 2014 as well and as usual it was great. Full of inspirational and educational talks, awesome people with awesome projects and great after party in Prague. Exactly, thank you. Thank you all players who are responsible for our existence. We appreciate everyone who opened the downloaded game, everyone who enjoyed the game even everyone who didn´t like the game but at least gave it a try. Because at the end of the day, it is all about you – gamers! So have an awesome year 2015!